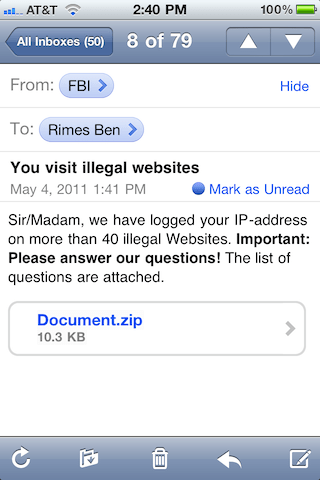 At least that’s what the FBI tells me….or rather, the totally fake and bogus email from some spammer/hacker pretending to be the FBI told me. I’m not new to the whole phenomenon of “phishing“, the practice of getting someone to divulge sensitive information, or install some sort of program or malware on your computer that will eventually worm it’s way into your system and/or trick you in some way to give up your sensitive data. I’m savvy to this type of cyber attack, mostly thanks to the fact that I spend a great deal of my time online, and have a better feel for when something “smells rotten”, and I practice safe computing. I always login to sites directly rather than from links in emails, and whenever I’m sent zipped email attachments I delete them immediately, unless I’ve been expecting the email from a trusted source (i.e. someone I know in the real world). What I started to ponder this morning, was whether or not students are savvy to this. Sure, kids are up on staying safe from strangers online and looking out for cyber bullies (at least at the elementary level), and for the most part I feel confident that the lessons I’ve crafted, experiences I’ve given students, and resources I use have prepared students to be on the lookout while using social networking sites, chat, etc. But what about something personal like an email or direct message? When it’s in their inbox, and is pretending to come from a position of authority (the FBI wants to question me? yikes! ), does conventional wisdom for staying safe from strangers apply? If this were to happen in the real world, I would hope that traditional “stay safe from strangers” programs would give students the ability to discern a real person of authority from some creep pretending to be a plain clothes police man, or a trusted “friend of the family”. When it moves online though, there can be some pretty convincing messages, emails, and other communiques that appear to have all the legitimacy of coming from an authentic figure of authority. What resources or strategies do we use as educators to help encourage students to be critical about these sometimes “hard to decipher” e-mails that come through sounding all official and highly important? I’ve used Surf Swell Island to great effect, but it really only addresses the issue in a cursory way, reinforcing the whole “don’t talk to strangers” online bit, and be wary of emails from people you don’t know. It doesn’t address my particular concern though. Which is why I was REALLY EXCITED to do a quick Google search and discover that the FBI itself has some great resources you can use with your students! As a part of their Scams and Safety page, the FBI has a number of interesting links about avoiding fraud and e-scams. You can report new scams that you suspect through the Internet Crime Complaint Center, take a test to figure out how well you’re protecting yourself from online scams at the Looks Too Good To Be True website, or get tips on specific scams via the FBI’s E-Scamd and Warnings page. Highly useful for a teacher of criminal justice, cyber-crime, or someone looking for some authentic resources (beyond the fluffly Disney-esque sites) to help their students better understand what to do when the FBI comes looking for them thanks to their illicit internet surfing. If someone else has a program, lessons, or resources that they use and would like to share, I’d love to know what’s working for you. Next:Video Story Problem – How Much Shampoo?! I used to use the Surf Swell Island with my younger kids, but I can’t get the Surf Swell Island activity to come up on that website anymore. It just shows a black screen in the middle of that website. Any suggestions? I think Disney may have finally found a way to do away with Surf Swell Island. They dumped it from their US site and replaced it with commercials, and infomercials geared towards parents, which was a huge let down. The Australian site I linked to is what I’ve been using for the past two years, but now I’m just at a loss. Hopefully it will come back, otherwise it’s back to hobbling together different resources. You should check out Net Smartz (www.netsmartz.org) as it seems a bit less cluttered than Wired Safety, and has resources for all age levels.